A beautiful picture book following two children on a windy day as they watch the wind fly their kite, fill the sails of boats in the harbour, turn windmills to create electricity - and then disappear. The simple and engaging text is accompanied by gorgeous illustrations by Elena Temporin. Encourages the reader to ask and answer questions about the wind. It is a great introduction to forces for Key Stage 1, and works well as a class book for Foundation Stage children as it identifies how best to feel the effect of wind. Other books in the series include The Rainy Day and The Snowy Day. 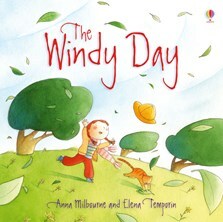 Synopsis: This beautifully illustrated book follows two young children who step outside to explore the wind. Written using simple vocabulary, it includes the notion of seeds being blown about and planting themselves, how the wind dries washing, and modern windmills that make electricity. A wonderfully simple book that conveys an important message, it will have children itching to get outside an experience it all for themselves! I just picked this book up yesterday for my 2 year old and LOVED it!! I am in the process of trying to get a book published, and this is exactly the look of a book I am trying to create. Absolutely wonderful illustrations! Thanks for the inspiration.